Midway through Disney’s Moana, the titular heroine, daughter of the chieftain of her South Pacific milieu, bristles at being branded “princess” by Maui, a cocky demigod voice by Dwayne Johnson. “If you wear a dress and have an animal sidekick, you’re a princess,” Maui ripostes. The moment is a bit of a wink, signaling that Moana is self-aware of the very Disney movie conventions it embraces. The story elements are familiar: the young hero(ine) chosen for greatness despite lacking age and experience; the overprotective father who values the safety of tradition over the risk of ambition; and yes, the animal sidekicks. It’s also a visually arresting and musically dynamic film that’ll leave viewers of all ages humming out the theater door, with a matter-of-fact ethnic and cultural diversity that’s both respectful and subtly uplifting. Moana (newcomer Auli'i Cravalho, tremendous) is a teenage girl hailing from the Polynesian island of Motunui, a happy utopia sustained by their fishing and agrarian industries. Chief Tui (Temuera Morrison), Moana’s father, has only one rule: never sail beyond the reef (see also: Finding Nemo). When the fish vanish and the coconut crops start to rot, Moana’s grandmother tells Moana she’s the Chosen One™, tasked to return a green jewel representing the heart of Te Fiti, the mother island, which Maui stole long ago. Moana’s mission: sail beyond the reef, find and retrieve Maui from his island exile, and together return the stolen heart and restore the natural order. The film finds its energy once Johnson arrives as the arrogant, egotistical Maui (an actual hero in Polynesian mythology), who basks in the glow of his own legend. Only Maui’s sentient tattoos, acting as a kind of comic strip across his muscle-bound physique, serve as a check on his conscience. Beyond returning the heart, Moana and Maui must also retrieve a magic hook that gives Maui his powers to shapeshift into an unlimited number of animals. Moana and Maui’s uneasy odyssey carries them through such perils as the Kakamora, a tribe of anthropomorphic coconuts turned sea pirates whose manic pursuit of Moana’s boat resembles a scene out of Mad Max: Fury Road. They must also retrieve Maui’s hook from Tamatoa (Flight of the Conchords’ Jemaine Clement), a giant crab with a penchant for scavenging and a missing leg, thanks of Maui. The film’s infectious Polynesian-influenced soundtrack was written by songwriter Opetaia Foa’i (performed with his band Te Vaka) with the unmistakable assistance of Hamilton scribe Lin-Manuel Miranda. Moana’s anthem, “How Far I’ll Go,” is this film’s version of “Let It Go.” The soaring “We Know the Way” is sung by Miranda and Foa’i. The ditty “You’re Welcome,” performed by Johnson, playfully introduces the self-absorbed Maui. The glam-rock “Shiny” creepily channels Tamatoa’s macabre magpie syndrome. The melange of tradition and modern animated films is found in Moana’s makers. Credited directors Ron Clements and John Musker are responsible for Disney’s The Little Mermaid, Aladdin, and Hercules. Yet, they received directorial and story assistance from Chris Williams and Don Hall, the duo behind the Oscar-winning Big Hero 6. Miranda and Foa’i modern songs are accompanied by a score from longtime action film composer Mark Mancini. The character conflicts and story resolution to Moana are familiar and pat—younger viewers will not require parental debriefing to absorb the themes or plotline. And there’s undoubtedly Moana merchandise ready to roll out for the Christmas season. But Moana herself is a modern heroine, full of independence and self-reliance, who needs guidance but harbors a latent fortitude that propels her to go it alone when necessary. 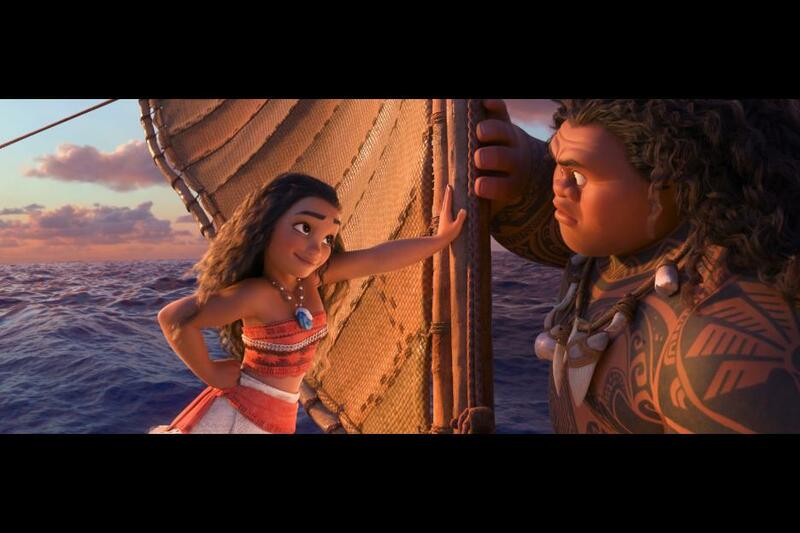 There’s no romance in this Disney production—Moana’s a lovely, striking princess who doesn’t need a prince. The parents don't die and there is no awkward inst-romance. There is no damsel in distress. It's amazing.